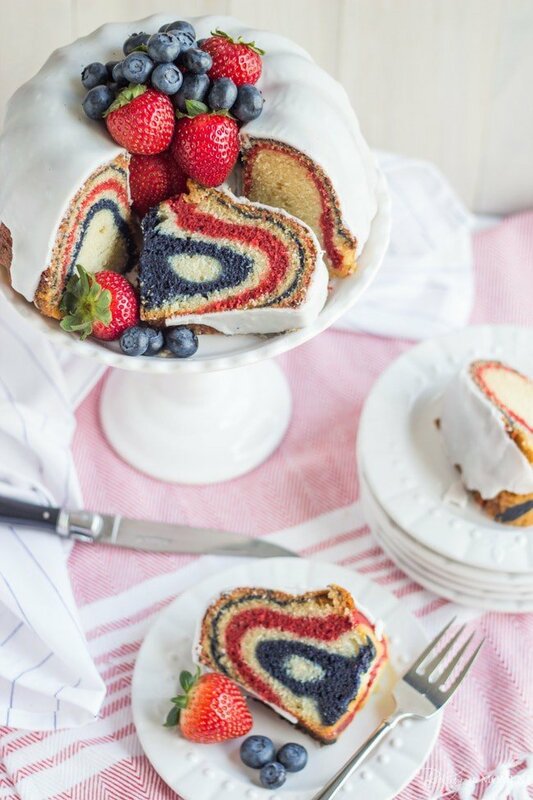 Surprise your July 4th guests with this jaw-dropping Patriotic Cake! 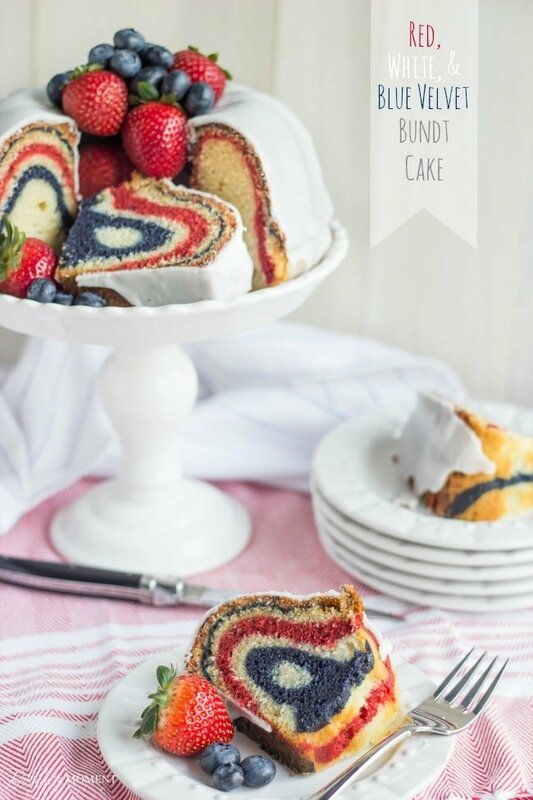 Ribbons of Red, White, and Blue Velvet Cake swirl beautifully in this Zebra Bundt Recipe, drizzled with a tangy Greek Yogurt Glaze and crowned with Fresh Summer Berries. I’m getting my red, white, & blue recipe in just in the nick of time, lol! Jaws are gonna drop when you cut into this beauty. 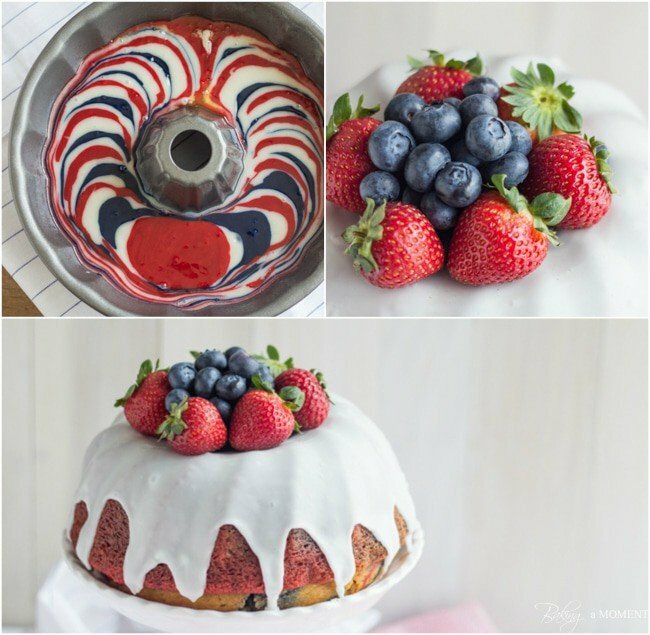 By all outward appearances, it just looks like an elegant white bundt cake, brimming with fresh and colorful berries. But inside, as you can see, it’s ribboned with stripes of red, white, and blue. The recipe is a classic red velvet cake, just divided into three bowls, tinted, and then layered into a bundt pan. Just drop about a quarter cup of batter at a time, one right on top of the other. They’ll spread in the pan and level out. Make sure you do white in between each of the colors- I just think it looks so much prettier that way! So you can really see the contrast between the colors. I purchased my bundt pan at HomeGoods and I have tried so hard to find you guys an Amazon link! I just had no luck, and the best I could do was this. Sorry, it’s ebay 🙁 But it is the exact pan. I also think this one would be soooo perfect, if you have time to run to a Williams Sonoma. As you can see my pan was just a bit smaller in diameter, yet taller/deeper. But I tested the recipe more than once and it works in a regular bundt too. The cake just comes out wider and shorter, and with a bigger hole in the middle. Also, it bakes faster in the traditional pan, so you’ll really want to watch your cake as it’s baking. I recommend checking it every 5 minutes, after the initial 35. Most of the time, for me, when it comes to cake I’m chocolate all the way. But this red velvet recipe is the exception. It is seriously SO. Good. Super moist, lightly sweet, with that distinctive buttermilk tang, and a little bit of caramelly flavor around the edges. I swoon every time I taste it. And the Greek yogurt glaze is a perfect compliment. Just be sure to add as little yogurt as possible, to really keep it thick. You want to really cover the cake with it, so you’ve kept the surprise for when you cut that first slice! Preheat the oven to 350 degrees F and spray a bundt pan generously with non-stick spray. Place the flour, sugar, baking soda, and salt in a large mixing bowl and stir briefly to combine. Add the buttermilk, oil, and egg whites, and mix on low speed until smooth. Scrape the bottom and sides of the bowl, and mix again for about 1 minute, to aerate the batter and develop the structure. Place ½ teaspoon of cocoa, ½ teaspoon of vanilla, and ¼ teaspoon of vinegar in each of two small bowls. Add the red food coloring to one of the bowls, and the blue and violet food coloring to the other. Mix about a cup of batter into each. Place about ¼ cup of red batter into the prepared pan. Layer with white, then blue, then white again. Repeat until the pan is filled. Bake for approximately 35-50 minutes*, or until a tester inserted in the thickest part of the cake comes out clean or with a few moist crumbs. Cool for 15 minutes, then invert onto a wire rack to cool completely. Place the powdered sugar and Greek yogurt in a small bowl and stir to combine. Pour the glaze over the cake and allow to dry. 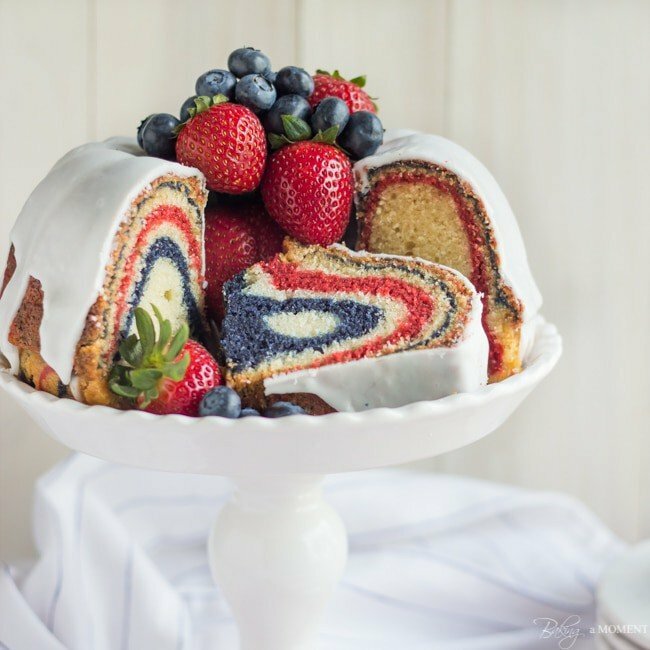 Fill the center of the cake with strawberries and blueberries, and serve. Bake time may vary based on the shape of your pan. Set the timer for 35 minutes and check the cake every five minutes thereafter, until done. Finally, I just want to mention, before I sign off: If you happen to be in the Philadelphia area, you should totally come see me! I will be at the Nutella Truck Tour at Freedom Park on the Ben Franklin Parkway, between 11 am and 4pm. It should be a lot of fun; the July 4th celebration in Philly is always HUGE! We’re looking forward to lots of good food, music (The Roots, Ed Sheeran, Nicki Minaj, Jennifer Hudson, Aloe Blacc, Ariana Grande and Vicci Martinez, <– starting at 7pm), and FIREWORKS OVER THE ART MUSEUM!!! Woo-hoo! Next Post » Happy Independence Day! Sooo pretty and just genius! I think you’re right on time with this. I love it!!! Thank you so much, Lina! I got in right under the wire, lol! Thank you Beth! I just had a look at your mini cheesecakes and it looks like great minds think alike (kinda!). Thanks so much for the sweet comment and I hope you enjoy your holiday! Lovely cake Allie, love the zebra effect. Have a great holiday! Okay, Allie. These delicious looking cakes have got to stop. You know I have to make this now right? And then I will eat it all by myself while crouched in a corner. Scarfing it down fist by fist. No one will forgive me. There will be crumbs scattered on the floor and I will be fighting the dog for them (okay not actually fighting it—animal cruelty stinks!). My face will be dyed red, white, and blue…but Hey! at least it’s seasonal. Hope you’re smiling. I am smiling all right, Margaret Anne! Thank you so much for the sweet compliments and the fun comment. Enjoy your holiday weekend sweetie! oh my gawd, Allie!! I love this cake!!! Simply fabulous! and have fun at the Nutella Truck Tour and hope you and the family have a great 4th!!! Allie this cake is absolutely stunning!!!! So perfect for the 4th!!! Love the swirls, the glaze and the berries too. Wonderful. Have a great weekend!! What a gorgeous cake, Allie! Perfect for the Fourth of July. Have a wonderful holiday! Thanks so much, Ashley! I hope you had a great time celebrating the 4th yesterday, and enjoying this gorgeous weekend! This is the best red, white, and blue dessert I’ve seen so far! Seriously, so unique and so so pretty! Wow, that’s such an awesome compliment, Meriem! I know you see so many beautiful desserts, mostly from your own kitchen! Thank you for the great feedback. Hope you’re enjoying the long weekend, and having a blessed Ramadan. Oh my! This is right up my alley! Delish! Pinned! Awesome, Zerrin! 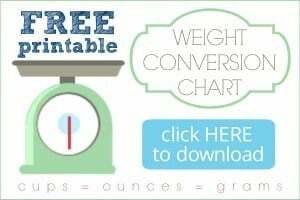 I’m so happy you like it, and thanks so much for pinning! How pretty and festive is this cake??? I never remember to tint batter, etc to make festive food! And with all those berries…. so summery! Have a great holiday Allie!! that is so fabulous! great for a party. This cake is seriously a stunner! I can’t even get over how gorgeous it is! Just shared! That’s what I call perfection! I’ve never baked an ordinary zebra cake let alone something as beautiful as this! Have a great holiday! Thanks Erika! I baked my first zebra cake a few months ago and just thought it was so much fun. The red, white, and blue idea came to me at the last minute so I just went for it! Thanks so much for the sweet comment; hope you’re enjoying the weekend my dear! Can this be done with boxed cake mix? I can’t imagine why it wouldn’t work… I would definitely give it a shot but be sure to use a white cake so the colors don’t get muddy. Good luck and let me know how it works out for you, ok? Thanks for reading, Andrea! Allie, this cake is beyond fabulous. It looks amazing! Thank you for the photo of the batter and how the swirls are made – I’m horrible at imagining how things are supposed to be done. I need the visuals, lol. This is the perfect cake for the 4th of July. I hope you and your family have a blast celebrating. I wish I were in Philly – so that I can visit you for dessert every day and to hang out with you at the Nutella truck. Have fun, lady! You’re going to rock the television appearance too. I’m so excited for all of these incredible things you’re doing! Thank you Nancy you are just the sweetest, nicest friend! I wish you were here in Philly too, I’d have you by my side all the time, lol! Oooh so festive! Love it! Allie, your photography is just gorgeous! I saw this on foodgawker and thought it was just stunning! I can’t wait to see what else you have on here, everything looks just beautiful! My husband and I are celebrating our 25th anniversary on the 4th. I thought I’d found the perfect cake for the 4th and our celebration, then a friend posted this on Facebook. Big switch now. It looks so difficult, but reading your recipe, maybe I could do it? It would be sooooo pretty and delicious. Hi! You could totally do it! I know it looks intimidating but it’s really no sweat. Just drop the tinted batter into the pan and the oven does the rest! I hope you enjoy, and have a happy, happy anniversary! Thank you, I’ve printed everything and am going to try to bake the cake Friday and frost it Saturday. Also, we live on a small island in the Caribbean, so I am so hoping I can find fresh blueberries and strawberries, or fresh rasberries and blackberries. I can always find frozen, but that won’t work. Good luck and I hope you enjoy! Thank you so much Catherine! And to you too! Hello..I am not a great baker and I want to try this but I will be in the mountains. Any tips for higher elevations? I’m sorry I live just barely above sea level so this is really not my area of expertise. I would try googling “tips for baking at high altitudes.” Good luck! Can I halve the recipe? if so will I need to change the temperature and the baking time? Thanks!! Hi Elizabeth! I wouldn’t recommend halving the recipe unless you happen to have a very small bundt pan. And it’s difficult for me to say exactly what the bake time would be without knowing more about the pan you’re planning to use. I always recommend testing cakes before taking them out of the oven- insert a toothpick into the thickest part of the cake and if it comes out clean you know the cake is done. If it comes out with batter or a lot of moist crumbs clinging to it, bake it for a few more minutes and then test again. Good luck and thanks for reading! “I purchased my bundt pan at HomeGoods and I have tried so hard to find you guys an Amazon link! I just had no luck, and the best I could do was this. Sorry, it’s ebay 🙁 But it is the exact pan. I also think this one would be soooo perfect, if you have time to run to a Williams Sonoma. How fun and festive! So great for a summer party! 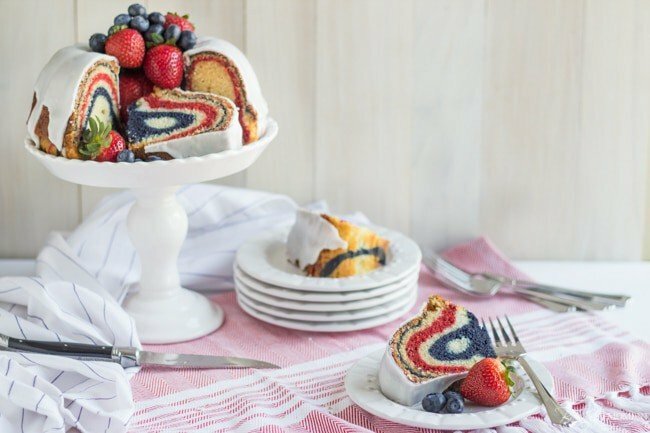 This is one gorgeous red, white and blue dessert! I’m going to make it for all the patriotic holidays! What a fabulous cake. This would be a showstopper at a party!